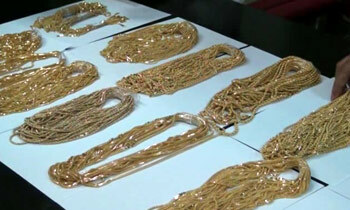 A 32-year-old Sri Lanka Air force (SLAF) Airman attached to the Bandaranaike International (BIA) Airport was arrested with two kilograms of gold jewelry worth more than Rs.10million by the Airport customs officers this morning, Customs media spokesman Dharmasena Kahandawa said. He said the customs found 2.65 kilograms of gold jewelry wrapped to his legs and he was arrested while he was on the way to the airport departure lounge from the arrival lounge. The suspect was a resident of Dehiattakandiya. “The suspect was trying to hand over the jewelry to a passenger at the Departure lounge,” he said. The customs investigations revealed the suspect had been in the same practice on several previous occasions, he said. Mr. Kahandawa said that he may have wrapped the jewelry to his legs inside an airport lavatory. What training ?? Trained by whom or copying some party?Ceylin............. just be straight.